The year is coming to an end and it’s time to celebrate the success of your business with staff, colleagues, partners and sometimes even clients. It’s the perfect time to show appreciation to all the hardworking individuals who made this past year a successful one! Whether you’re planning a small luncheon at a local restaurant or hosting a large gala for your annual party, here are some tips and ideas to think about that will help make the party a memorable one! Where will you be hosting this years event? Seeing this is a corporate event, there is more of a selection since the date can be a weekday. You definitely want to book this with as much notice as you can. Our suggestion for larger parties (guestlist of 100+) is to book as soon as this year's party is done – so basically a year in advance. This is more important when you want to have your holiday party on a weekend vs during the week. You will most likely save on costs, as prices due tend to increase every year AND you will get the venue of your choice. There are so many venues in and around the GTA, for any type of party you wish to have, but we always suggest to know your guest count beforehand. Themes always make an event more interesting and fun. Tis' the season and make it an 'Ugly Christmas Sweater' party (this is getting more popular as the years go on) or a 90’s themed holiday party. Maybe you'd like to have a more formal evening, but who says formal can’t have a theme? Make it a black tie affair . Or you can't go wrong with an all white holiday theme with lights, sparkles and maybe even a snow machine. 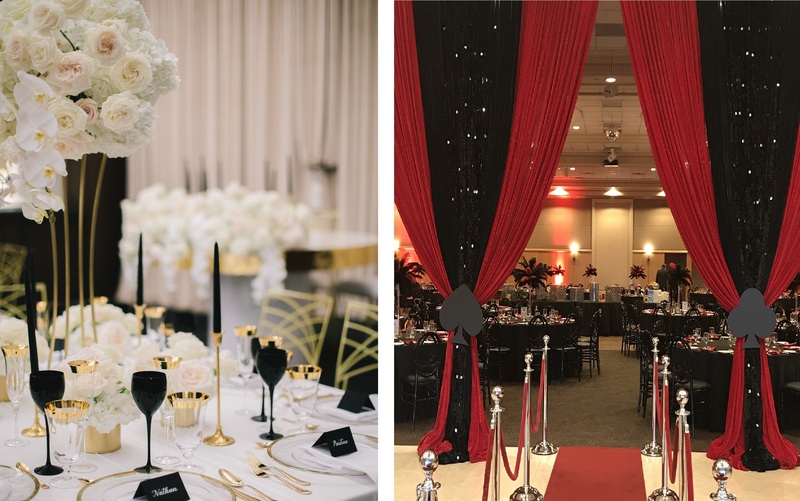 The options are endless, and since we're dedicated and creative event planners we can help create a holiday event that everyone can enjoy. Having a theme will get your employees interacting, possibly get them out of their comfort zone and most importantly get them into the holiday spirit! If you've decided to go with a theme or just want to stick to a colour scheme, decor is a great way to wow your guests. If you've picked a theme, go with it - make sure to add all the fine details to bring it to life. The entrance is a perfect place to start, as we all know the importance of first impressions. Even if you're having a small holiday party, decor is always a great idea. Whether it be centerpieces, cute signs at the bar or food stations, even customized napkins with your company logo. Adding tabletop decor (charger plates, upgrading the cutlery and/or even glassware) will help bring that WOW factor and definitely impress your guests! There are many event decor companies in the city that can help bring your vision to life or just ask us, we can help. Now this is a BIG one for most companies. Do you extend the invite to spouses or employees' significant others? We say YES! 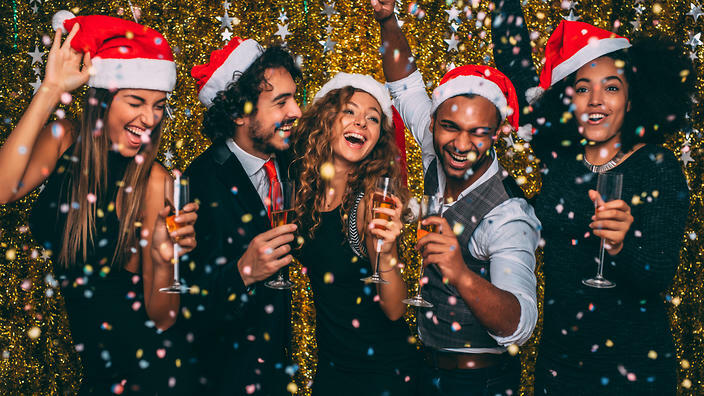 Depending on the budget, venue capacity and what you have in mind for overall atmosphere, extending the invitation allows your employees to feel more comfortable with going to the company holiday party. As you may know and maybe have experienced in the past, people sometimes dread going to their work Christmas party. Extending the invitation also allows co-workers to get to know each other on a more personal level. It's even great for management to experience and socialize with their employee and significant other to create a more personal relationship with one another. It’s always a great idea to give your employees incentives to push themselves, and we all know, EVERYONE loves to be appreciated and rewarded in some way, big or small, for their hard work. Within your company, if you haven’t done so already, why not create a Highest Sales, or Team Leader award, or create awards a little more fun. For example, “Least amount of sick days”, “Best Dressed” or even “MVE" (most valuable employee). These can be based on employee ratings to make it more interactive. Simply set up a ballot prior to the event, and for the awards, you can give away gift cards, gift baskets, or even a weekend away for the main draw. As you know, sometimes these parties or gatherings can be a bit on the boring side, maybe even awkward for some. It's always a great idea to include some type of entertainment, depending on the type of party you’re hosting. Music is ALWAYS a must in our eyes. Nobody likes to attend an event that has no music, even if it's just in the background, this will create a more comfortable atmosphere for guests. So, if your simply hosting it at your office or maybe someone’s house – make sure there's some type of music playing. Keep it simple with an iPod dock and use Apple Music or Google Play and choose a holiday inspired playlist, or take from that budget and spend it on a DJ. Trust us when we say – this will make a huge difference. OR why not turn it up a notch and hire some live entertainment. Having a cocktail party? Why not hire a jazz or violin trio to entertain your guests. If it's a dinner party, you can have some ballroom or Latin/salsa dancers to perform. If your budget is a bit larger, hiring a band or even bongo or saxophone player(s) to open up the dance floor and get the party started. There is so much talent out there, no matter what you have planned for this annual holiday party. Entertainment is always a great idea that everyone will enjoy and keep your party lively. Check out our friends at Bongo & B Entertainment as they have a wide variety of musical entertainment to add that WOW factor to your event. What about a photo booth? Who ever said no to a photo booth with fun props? The photos are a great keepsake to take home, or better yet take back to the office. Your guests will remember how much fun they had at the ‘ABC’ work party and be able to show all their friends. Add your logo to the template and voila! This expense has now become marketing! Adding a slideshow to the event is a great touch as well. It's a recap of all the wonderful memories that took place during the year. It will give guests the opportunity to reminisce about all the great times they had with the company and with their co-workers. 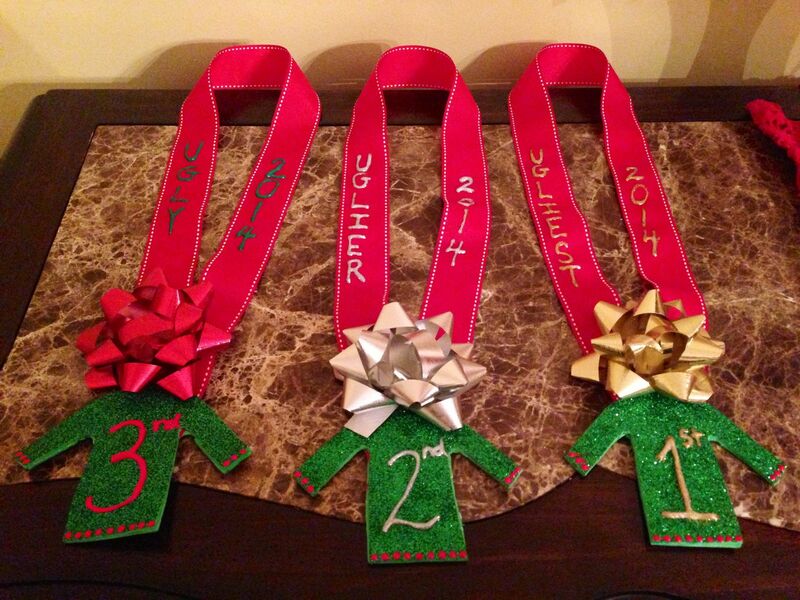 You can even include special moments or milestones, such as promotions given, accomplishments or even social committee events took place during the year. A slideshow makes a great conversation starter as well.. "Did you see that picture? or "Do you remember that time?". Yes, yes yes, this will go far! If you’re thinking of gifting your employees with something this year – DO IT. Again, people love to receive gifts and be appreciated in anyway, so what better time than the holiday season. This could be something small from cute individually wrapped cookies from The Cocoa Cakery, personalized ornaments or gift boxes from Boxed by Co., gift cards for their morning coffee run or to their favourite restaurant. A grocery store gift card is another great idea, where staff can put that money towards their family holiday dinner. Whatever you decide to gift to your employees, make it special by wrapping it or placing them it holiday inspired gift bags, and then hand them out at your holiday party. Photography/Videography – What better way to capture these special moments then hiring a professional photographer or videograher (or both). It’s always important to capture the moments that help to reflect on everyone’s hard work and effort throughout the year. Think of this as a double whammy. These pictures/videos can be used later, maybe a flashback slideshow on a milestone year, or better yet, promotional material. Hire a corporate event planner to take care of everything, so you can actually enjoy your holiday party. Most companies have social committees or an assistant that can handle the planning, BUT they do have a job to do and probably a ton of work to get done as well, so why add another task to their list? 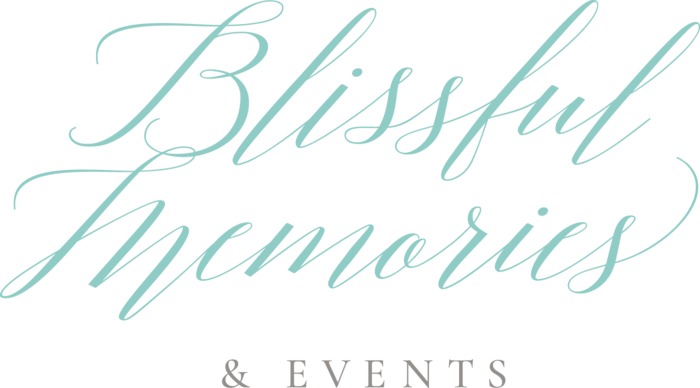 Of course they will be involved, as it is your company party, but they won't have to worry about the vendor meetings, site visits, decor, gifts and so much more. Planning an event can be very time consuming and shouldn't necessarily be put on your staff to take care of. Corporate event planners have various holiday planning packages that can be customized to fit the companies needs and budget. Contact us to see how we can help plan your holiday party!